Situated just a few blocks from the vibrant French Quarter and Arts District, this hotel features beautifully renovated rooms, stylish dining and much more. A member of the Historic Hotels of America, the was originally constructed in 1927 as the Grand Lodge of the Louisiana Masonic Temple. The hotel is just steps from restaurants, music venues and attractions. Rooms and suites feature a wealth of modern amenities to ensure a comfortable stay. The hotel also features a fitness center, indoor swimming pool and a whirlpool. 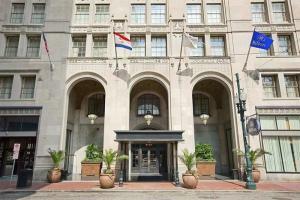 Located in the French Quarter, just blocks from Canal Street.